A fabulously glam estate sale, new acquisitions! About once a year I get invited to an estate sale that is a time capsule of kitsch and a Mecca of mid century madness. This weekend I was shopping in a neighborhood I have driven by many times in my life never knowing that these awesome mid century splits even existed. A very cool layout that was disguised by the curb appeal of a ranch. Inside were treasures so great I was thrilled just to see them in person. Have I had a bigger budget I would have bought more! Many items need rehab, cleaning and TLC, so I will get through them and then list. I have some folks already claiming things so I will be working in order of request. Have a look at the fun! The first item I already listed in the bunch is a gorgeous brass finish Hollywood regency bar cart. It features two removable brass shelves, caster wheels. Some oxidation to the finish which did not clean with a polish. Could be painted over if you don't like the patina. Available now in the etsy shop. Already claimed is a really cool plastic plant with orange fronds ala Horton Hears a Who. I had an interested party who spotted it in one of my pics from the sale and although it was claimed, I got there yesterday to find the claimed only took one of the 2. I will be removing the cement from the pot, cleaning and getting this sent to Buffalo. It does not get any kitschier than this! PURCHASED FOR JOYCE. Next up is something I picked for my own foyer! A fabulous 24 arm Sputnik chandelier! It's going to look great here after a rewire and polish! Guess what? I have a 16 arm Sputnik I was going to use in my dining room which will now be up for grabs! I have it listed in all my markets. I priced at $350 including your shipping. A Brooklyn competitor has the same light st $550, so I think I am under value. You will need to buy bulbs which gets expensive. Voltage meter tested with no shorts and all sockets viable. It will work as is but you may want to rewire for current standards. UPDATE SOLD! Great size for dining room at standard height ceiling. Speaking of lights, I got more!!!!! I invested in many unique lighting pieces at this sale. Period lighting is always a treat but mass quantities is overwhelming! I got some great pieces, all of which will require rewiring and rehab work and even some parts. I will invest in getting them back in working order. The first beauty is an impressive suspension pole lamp that feautures hanging bullet planters under the lights. A total unique piece! I have an interested buyer so will be working on this one first and offering her first shot. If she declines, it will be listed in my markets. THIS PIECE HAS TWO ON THE WAIT LIST Absolutely amazing! This one will need minimal work, just checking over and rewiring if my husband deems necessary. The plastic plants are saved and will ship with the lamp. The next suspension pole lamp is in need of globe replacement. One is missing, one cracked and one good. I will keep my eyes peeled for replacements in the coming weeks. it's the lamp in the right. This awesome lamp was left behind by the claimer because it had no guts! I was able to snag it yesterday. It needs total rehab including paint, wiring and sockets but those fiberglass shades? THEY ARE PERFECT and just need cleaned. Will be working on this in the coming weeks! I have claimed this fixture and will be removing it next weekend then rewiring. You don't find stuff like this anymore! 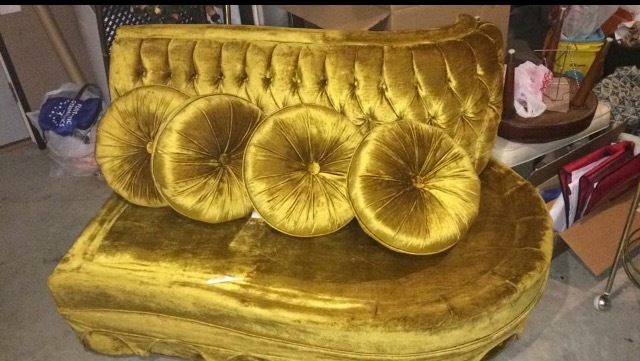 My favorite acquisition, though, is a stunning tufted custom 3 PC sectional. I have already gone over the end pieces and cleaned them and evaluated. Structurally we are about 100%. The only issues are some stains on the seat cushions and minor wear to the velvet. I will be replacing the seat cushion foam but hoping I can find a fabric match because I would have new covers made as well. This will be an expensive undertaking though, so will have to save up before I attack or find someone who is serious and would pay half deposit so I could fund the work. This is such a stunning piece and I am in love! As it sat in it's home since the 1950's. The skirt can remove to show MCM walnut peg legs but I am really digging this particular skirt! It's a great color! You can see how bold it is out in the natural light on an overcast day. If you are interested please reach out! I would, of course, deliver in my region with shipping available through my chairish shop. It truly is a gem and I am thinking finished price will be around $2000.